I figured it's about time an updated "beginners" thread be posted. I hope I included enough info. I just bought one, what are the first things to do? In order: Downpipe, replace stock intercooler and charge pipe(s), GMS1 (3-bar) sensors, tune. If you decide you want an intake, that's up to you, but tune AFTER installing intake. What's this ticking under the hood? Direct injection cars use a high pressure fuel pump. You're hearing that as well as the injectors pulsing. It's normal. Any intake you get will require a tune to avoid skewed fuel trims. Injen, ZZP, Hahn, Dejon, and some others go into the fenderwell. This is not recommended for daily driving as it is very close to the ground and water will interfere with the filter. K&N SRI (or custom) are Short Ram Intakes which pull air from behind the headlight area (heat shield included with K&N) and should not be affected by rain. If your car is stock or GMS1, I recommend sticking with stock box AND stock paper filter. K&N drop in filter will only cause harm over time. My filter got oil on my MAF after about 8 months of use. Stock is $20 each and, depending on driving, I'd just replace once a year. ZZP upgraded tube if you're sticking with stock box AND want to tune. Who tunes these cars? How? Kevin Moyer (kmo43), James Rakes, Jon Mic, Mad Scientist Performance, as well as ZZP if you're local to Michigan. Facebook groups have more information on this, and many other people can tune you. They tune through HPTuners. Many people have these and can assist with tuning. It requires you to unlock your VIN for tuning. It uses a credit system for VIN unlocks, 2 credits/VIN and new they come with 8. Learn down refers to the PCM restriction that prevents the car from outputting more than stock 260hp/260ft-lbs. This means that any engine mods you do, intake, downpipe, charge pipes, intercooler, nothing will change performance until you tune. GM Stage 1 does not remove this but loosens its restricting ability. It has always been recommended to buy and install your parts, and then get tuned. Intake should be the last thing to go on before tune as that will skew fuel trims the most. Jason Perotto. Period. B3Design on Facebook. It'll cost you, but it's done properly. Powell also builds transmissions if I remember correctly. Will also cost a bit, but they both know what they're doing. If you're stock turbo, none. The stock one is fine. Forge recirculating if you are worried about the stock one breaking. External is a big no no unless you relocate MAF and tune for it. What clutch should I get for XXXhp/tq? GMPP (LSJ upgraded clutch) will suffice for most builds. If you insist on getting aftermarket, SouthBend clutches are probably the second most used. Other options include KY, SPEC, Clutch Masters, and Exedy. What else do I need to replace the clutch? You'll need a clutch of your choosing. A flywheel, clutch pipe, throw out bearing, 8 OEM flywheel bolts, and 6 pressure plate bolts. Some kits come with extra parts that might have been mentioned, but that's the minimum you'll need. Flywheel choices include OEM, ZZP, LuK. IMO that's the order you should go in. OEM is usually expensive, unless you can find a deal on one. ZZP is basically LuK but usually have better stock. Check RockAuto for stock of LuK. DO NOT RESURFACE THE FLYWHEEL. Can't stress that enough. Oh, and if you daily drive, from what I've read Fidanza/lightweight flywheels do not respond well to traffic. Choose a flywheel wisely as the clutch job will take ~8 hours if not more. For loud, TurboXS RFL is a single resonated 3" exhaust. For mild, TurboXS FL is a dual resonated 3" exhaust. For quiet, TurboXS GT, and Modern Performance are resonated and muffled exhausts. Obviously there are many places to get exhausts from, Magnaflow is another that is also resonated and muffled, ZZP you can build your own exhaust so if you want resonators/mufflers you can select what you'd like. I will link this thread which is what I used for reference when picking my exhaust out. Note that due to technology, not all the "tone" is captured in the video. These exhausts tend to have a nice low "rumble" that the camera just can't pick up. Youtube searching the exhaust you are interested in also yields pretty good results! My car just hit XXXXX miles, what should I do? Clean your intake valves, change spark plugs and gap to OEM 0.035", change transmission fluid, Control Arm Bushings (CABs). What transmission fluid should I get? 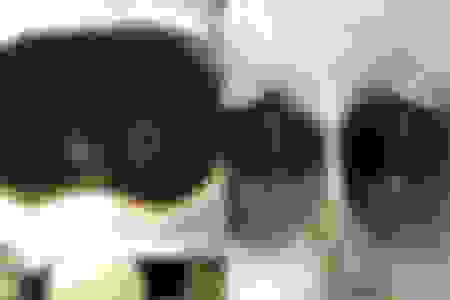 OEM 19351859 or 88862472. The first superceeds the second, but they are both still available for purchase. The F35 takes 1.7 qts of fluid. My car won't shift out of gear, how screwed am I? The most common issue here is the roll pin. The pin that connects the shifter bracket to the transmission selector pin. It rusts, shears, and won't allow your shifter to move, or your car to shift between gears. Can I put a catch can on to prevent DI valve coking? Short answer, no. So far, the Powell air oil separator is the best solution to DI valve coking. In my opinion, the ONLY solution. A simple baffled catch can will not provide you the same results as the AOS as it is specifically designed for these cars. It taps into appropriate lines, routes oil back to dipstick tube, and removes OEM PCV system that causes all the problems (if you opt for v.3). Long answer: The OEM PCV system is flawed, and even changing the valve will still not yield a clean intake system. This is because the valve leaks. I found a puddle of oil where my PCV valve was and the whole intake manifold was gunked up with carbon. The Powell system taps into all the PCV lines, except fresh air in, and successfully removes oil from the PCV system (evidence on the dipstick). I highly recommend the v.3 kit with the intake manifold so you don't have to clean your filthy one and reuse it (unless you would like to, the tap and plug will be included if you choose to keep yours). Email [email protected] to order. What can I do for mounts? OTTP and Powell sell Stage 1 mount kits which include a front transmission mount, spacers for the front mount, and a rear transmission mount spacer. This rotates the motor & trans forward, allowing for better alignment of the axles. The kits range from $100-135 Stage 2 mount kit includes front trans mount, spacers for the front mount, and an extended rear transmission mount. OTTP Stage 3 includes the Stage 2 mounts and an upper transmission mount (under the fuse box). The rear LNF OEM transmission mount will work fine, that's why Stage 1 is an option, because it's the front mount that's weak (gaps in the bushing). ZZP has mounts but they are NOT rotated mounts. I want more gauges, can I get a wideband? Technically, the OEM LNF upstream O2 sensor is a wideband. Whether or not it's accurate, I'm unsure of. I monitor A/F using a CN series Aeroforce Interceptor gauge and it seems to work for me. The interceptor gauge has various monitors including oil temp, coolant temp, misfires, knock detections, lambda, etc. A very useful gauge that simply plugs into the OBD2 port. What wheels are available to fit over Brembos? Some manufacturers (like Varrstoen) will redrill for an extra cost. Offset does not matter as much as shape. 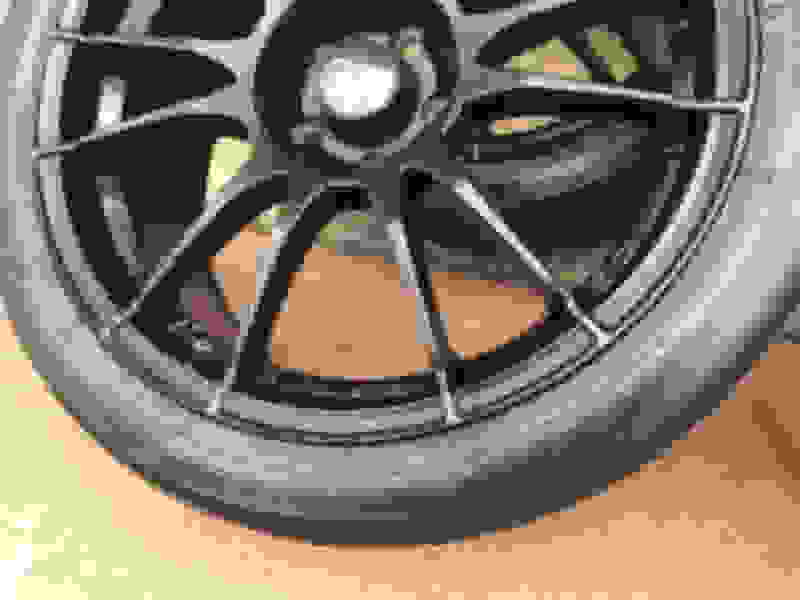 What's the widest tire I can fit on stock LNF wheels? Transmissions do not like torque fast, 3rd gear doesn't mesh 100% and the synchros can get destroyed pretty easily. Timing chain, once the tensioner goes the rest of it pretty much ***** the bed. More common on older/non VVT cars. Turbo failure, K04 hits peak efficiency around 23psi. Anything more than that and you're just blowing hot air and straining the turbo. Sway bar endlinks, the OEM ones are junk and will fail quickly. MOOG aftermarket LNF part number K750012. Powergrid if you're ok spending big bucks and want adjustability. VVT Solenoids, the two stick like things on the left of your motor. "Pourous block" was an issue that happened on late '08 early '09 production date cars that involves the block developing a hairline crack that leaks coolant into the motor which ends up in the combustion chamber and/or on the ground, or even in the oil pan. If you think this is happening, check the oil color, check the exhaust for white smoke, sweet smelling. Watch the coolant level! If you see it using coolant, by dripping it on the ground or it just "disappearing", this may be pourous block. I want to run E85, what do I need? At minumum, if your car is not a 2010 model, injector seals (e47 should be ok on stock seals, but it's safer to change them), and upgraded cam w/ fuel lobe (stock cam with bigger fuel lobe). If you're planning on going all out, Opel injectors, and possibly upgraded HPFP. What parts interchange between coupe and sedan? So far the only things I've noticed between the two are the door panels (and windows and doors obviously). They are essentially the same platform, just different bodies. Suspension, exhaust, etc will all transfer over. Coupe and sedan bumpers are different. Coupe and sedan trunks are different. You cannot put Cobalt coupe bumper, trunk, or tail lights on a sedan. 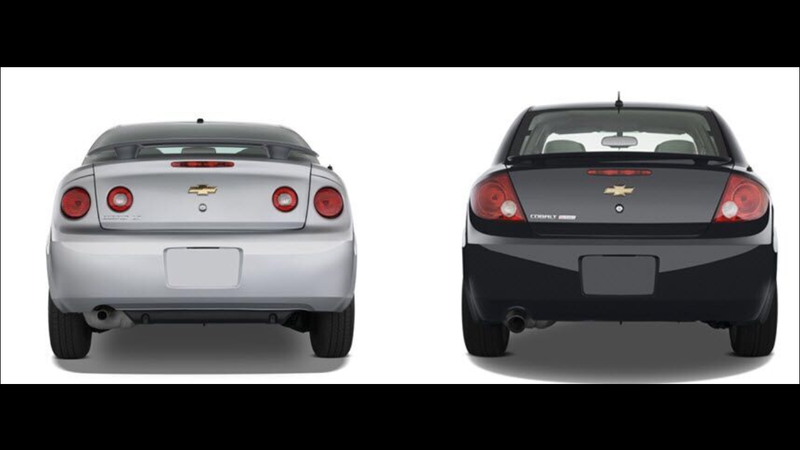 You can swap the G5 rear bumper on the Cobalt coupe if you relocate/delete reverse lights. What suspension mods to do? What about for low? The best combination for these cars is Koni struts and shocks and Powell YYZ springs. The Koni front struts require disassembly of the OEM FE5 strut and reuse the housing. It is for that reason I will recommend just OEM LNF FE5 front struts with Koni rear shocks, and YYZ springs. Bilstien also makes rear shocks for our cars. I found them on SummitRacing odd enough. They're a little more than regular FE5 shocks price wise, but not as much as Koni's. For coils, there's BC, HSD, D2S, Megan Racing, KSport, KW, and Raceland. The most popular choice nowadays is BC's as they're still popular and easy to get. HSD are a bit more expensive and less popular. Megan racing and Ksport can be found on ZZP. KW on OTTP. As for sway bars, 1.25" seems to be the best for street/track use. 1.5" is a bit big and results in wonky feeling at higher cornering speeds. Last edited by ThePanduuh; 02-06-2018 at 12:31 PM. For those interested in cleaning valves, installing the Powell v.3 kit, I documented my process here. Walnut blasting is NOT the only option. In fact, I don't recommend anyone do it that hasn't done it before. You certainly need the proper equipment. I did not do 100% perfect cleaning them, but man do they look a ton better. I highly recommend every LNF owner to look into this if they're having misfires, poor MPG, and overall lacking in performance. If you happen to get an LDK manifold for your LNF and try to swap between the two, you'll notice the LDK manifold is just SLIGHTLY different than the LNF manifold. I solved the sensor fitment problem in this video. I have several parts to install this spring(ish); ZZP intercooler kit (with charge pipes, couplers, and clamps), new fog lights, OTTP front trans mount and rear keyhole spacer, and a new roll pin (nested pins). I also plan on doing an update with the Powell separator. Using a borescope camera to examine how the valve stems look after ~12k miles, ~8 months. Stay tuned! Last edited by ThePanduuh; 01-27-2018 at 03:53 AM. Good writeup. I think you are going to see more guys upgrading the hpfp and leaving the cams alone unless they are building the motor/changing a head. This is great and should be stickied. Suggest adding Billstein as an option under suspension and talking a bit about coilovers since some folks will not be happy with the drop YYZ's give them and are (unfortunately) more into looks than handling. Also, under interchangeability, maybe mention that the trunk lid and rear bumper are not interchangeable between coupe and sedan. Seen this question asked a lot. Also, taillights are NOT interchangeable between Cobalt sedan and G5 coupe. G5 trunk fits on a Cobalt coupe if you want to get rid of the trunk reverse lights. Great write up! thank you for taking the time! No problem. I found it pretty easy to write most of this. Just helping out the noobs who ask the same questions on facebook. Looks like a good thread. Im sure it could Be stickied. I would suggest removing tuners from the tuning section. You'll only start debates on here, and there are plenty you've left off. Great stuff. Don't forget to mention exhausts. That is quite common also. I'm not sure if it is all 18' Enkeis will fit over the brembos, but the EKM3s and M52s do. Elaborate on this? I sometimes notice something that sounds like a coat hanger sliding around when I corner hard. Is this said trunk monkey? It's the EVAP purge. Sometimes when you sit at a light there's a banging in the back. Don't know why they had to make it so loud on this car. Mine sounds like someone is lighting off ladyfingers under the gas tank.... you are right I've never heard any other car be as loud. Also I love the trunk monkey commercials. Especially the theft deterrent one. While I don't have an LNF, this was a great concise read. Well done! remove james rakes as a tuner and the list looks good. He is a god on Facebook. Those are temper tantrum starting words on SS gang.